Reclaimed Wide Plank flooring is one of the most unique design choices available today. With the natural characteristics such as nail holes, insect markings, weather checking, knot structure and tannins, there is no way to recreate the nature-made attributes. Our Reclaimed Wide Plank flooring is 100% sourced from reclaimed structures and can be FSC® Certified upon request. We strongly believe in producing random width flooring because it offers the most natural look, as well as less waste and a better pricing structure for our customers. However we can do fixed width requests if needed. We offer many different species of reclaimed woods. If you do not see the one you are looking for, please use the Contact Us link. We come across many other reclaimed species that are not in our standard offering and are more than happy to accommodate special requests. The many attributes to reclaimed Long Leaf Heart Pine have stood the test of time and make it one of the most popular reclaimed floors. The warm richness of color and durability of its heart wood is undeniably the most recognizable of these traits. The varying grades can give you an elegant to a rustic country floor. We have prefinished many reclaimed Heart Pine plank floors and the warmth of this heart wood always prevails in the rich patina achieved by multiple coats of tung oil. 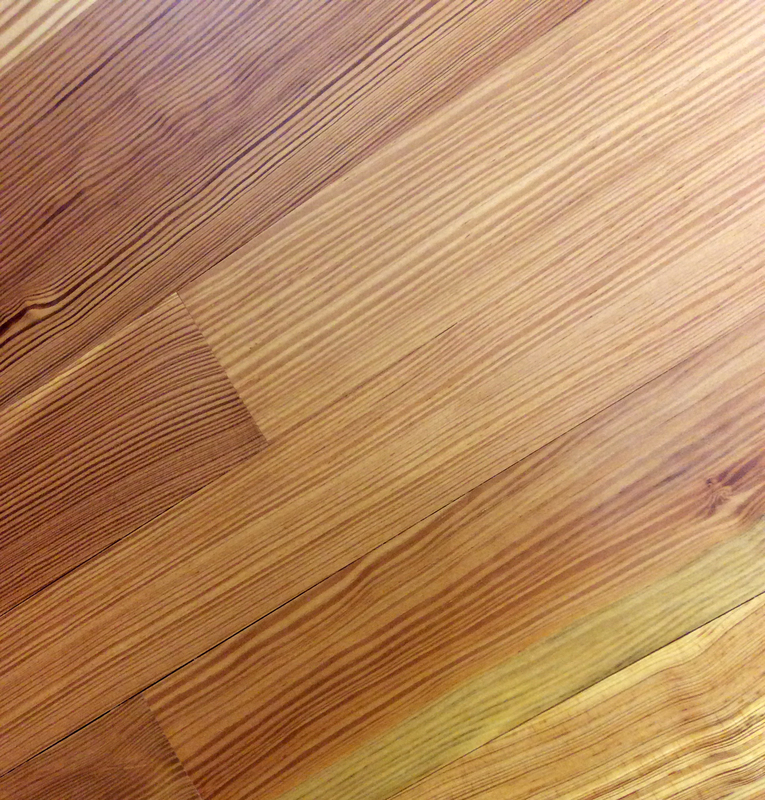 Reclaimed select vertical grain Heart Pine is an elegant flooring choice. Bingham’s craftsmen rely on our 69 years of experience to quarter-saw the antique Heart Pine timbers. This highly sought after grade of flooring features tight vertical grain, maximum heart content, minimal nail holes and small tight knots. New construction, renovation, or building a reproduction; this flooring is found through historic homes, water front estates, brownstones, and countless homes in between. Antique select vertical grain Heart Pine is traditionally re-sawn from large selected heart pine timbers. The timbers are then quarter-sawn by skilled craftsmen to maximize the yield from the tight grained timbers. These timbers are found in centuries old industrial buildings, as well as many southern U.S. structures. Southern Yellow Heart Pine was harvested to almost extinction in the early 1800’s for use as building materials for large factories and plantations during the Industrial Revolution. * Please note due to the reclamation process and the natural differences in reclaimed wood, our displays and samples are close representations of a finished product. Each floor is unique and may contain more or less characteristics than represented. Wood is a natural product and because of this, we recommend ordering samples of our products before making your flooring choice. We will send multiple pieces of each product to give a full representation of the grade and specie. Together, these pieces represent the grade, specie or product specified. Please do not reference an individual sample, piece of the sample or image as an accurate representation of the entire grade, specie or product. Please consult your sales representative with any questions or to request more samples.